We bring our expertise and unique Grand Prix experience to your project. We have possibly the biggest collection of expansion chamber templates in the world. So our starting point is deep expertise and know-how. But that's just how we start your brief - then we recognise the balance between drive and top end power - because a pipe is a compromise. The pipe has to work at all the speeds in all the countries you're intending. And that means custom design. After the design, we hand-fabricate your pipes using our templates, our design and our experience. We cut the tapered bend shapes and allow for angle changes and even metal stretch. 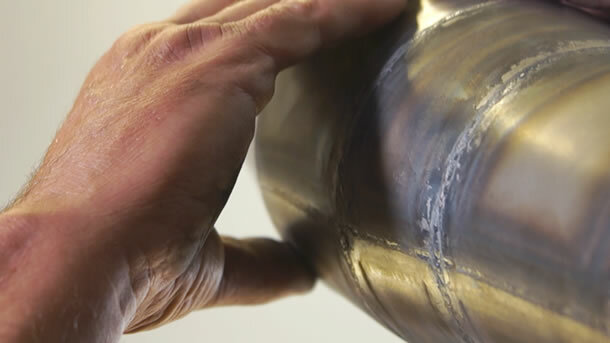 Pumping the shapes with oil can make for optimal exhaust gas flow, but only experience defines when, where and how much pressure to use in the fabrication process. We fit the pipes to your machine, tuck them in for maximum ground-clearance and make suitable mountings to eliminate unwanted vibration cracking and to improve aerodynamics. And finally, after you've tested the bike, we can provide further development in our workshop.